The $65 million FHL Tower finally got the approval for the pro­ject to move ahead. The first phase of test piling starts next week. FHL Group chief executive of­ficer Nouzab Fareed said the test piling will show if there are any unexpected items below the sur­face. The first phase will be complete in six weeks. Mr Fareed said he is expecting the foundation to be completed by June 30, 2019. The delays in the past months were because of the problems faced with certain construction issues. 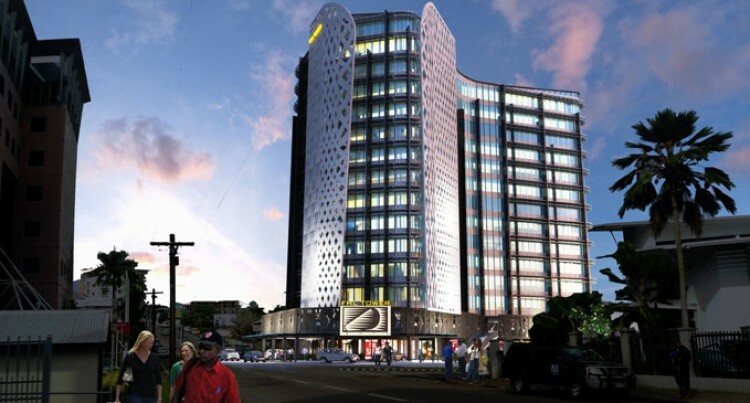 If all goes to plan by the end of 2021 we will be able to see a brand new iconic 17 level building in the Suva City. Mr Fareed thanked ANZ for financing the project. Mr Fareed also praised the project contractors for work­ing together to ensure the project starts on time and is complete on time. Mr Fareed said they have learnt from those unexpected events. “We want to get it right the very first time,” he said. Pacific Cement a subsidi­ary of Fijian Holdings Lim­ited had an unexpected good month in February. The company had undergone some tough times which forced manage­ment to think outside the box. The first six months of the company’s fi­nancial year from January to December 2018 was not good. Management were wor­ried so bold steps were taken to improve the company performance in February. One example: For the first time the com­pany started barging cement from Suva to Labasa via the Government Jetty in Lami to Malau.